Observation - miked's 281st spot submitted on 29th September 2009 - UK and Ireland. 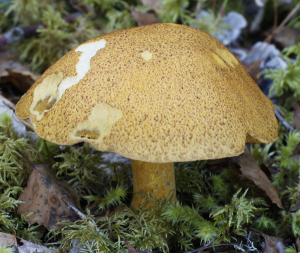 Description: This bolete was growing on the road with birches. I had photographed that exact spot about 20 years previously when there were just lichens growing on the abandoned tarmac, now there is dense moss and leaf litter cover and these fungi. This bolete was growing on the road with birches. I had photographed that exact spot about 20 years previously when there were just lichens growing on the abandoned tarmac, now there is dense moss and leaf litter cover and these fungi.